You will be given a Free reference e-book to read which has 450 pages And the test will be based on that e-book. What is Medical Surgical Nursing? Medical surgical nursing refers to a specialized area in the field of nursing which is more concerned about caring for adult patients in a broader setting. It is considered by most aspiring nurses as one of the entry-level positions that they can use as stepping stone to reach other specialty areas. It should be noted that medical surgical nursing is now considered as the biggest group of professionals within the nursing field. The most recent advancements in the field of nursing and medicine allow the medical surgical nursing field to also evolve based on its unique specialty. If you want to become an effective medical surgical nursing expert, then you have to consider enhancing your set of knowledge and skills in all aspects related to adult health. You need to have excellent technical, prioritization, organizational and assessment skills. You also need to know how important it is to constantly measure and improve your delivered health care services quality. It is essential for you to prioritize the safety of your patients first while identifying their best interests when it comes to health. If you are seriously contemplating about becoming part of the medical surgical nursing industry, then be aware that you can increase the level of your knowledge and expertise about it with the free medical surgical nursing practice course which you can access at Brainmeasures. This practice course has a free study guide and practice test that are essential in your attempt to easily handle and pass the related certification exam. 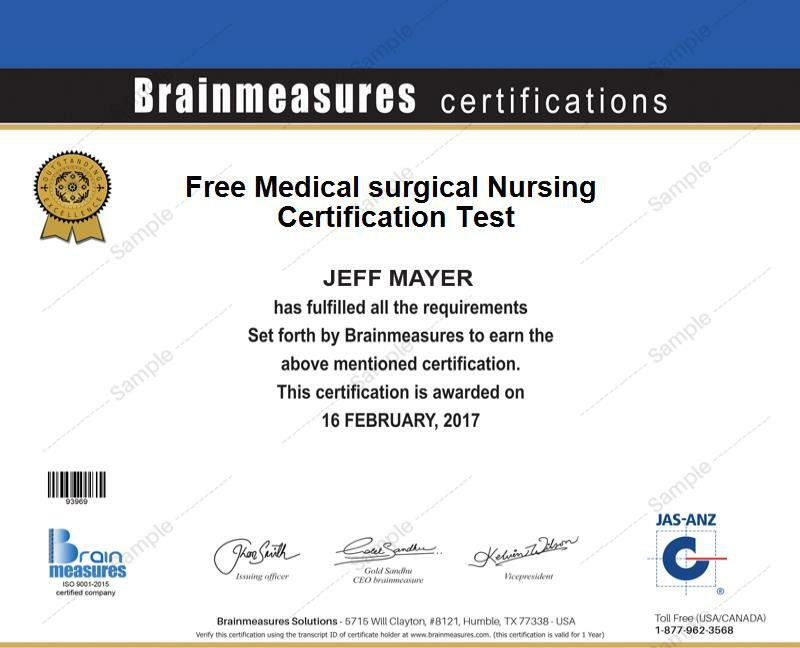 Brainmeasures free medical surgical nursing certification practice course is definitely beneficial for you if you dream of becoming one of the most renowned experts in the medical surgical nursing industry. This free practice course is one of the most impressive offers of Brainmeasures apart from all the comprehensive and professionally developed online certification programs that the company provides. With the presence of the free study guide which talks about medical surgical nursing, you will no longer experience difficulty in totally understanding the scope of this industry, its major functions and the specific roles and duties that you need to fulfil after you become certified. The free practice test which is also included in the practice course is also essential in your attempt to gather the necessary competence and ability to pass the actual certification exam in the medical surgical nursing field. With this, you can easily establish a strategy which will bring you towards getting a passing rate. Lots of individuals and professionals who strongly aim to become part of the nursing industry can generate benefits from enrolling in the free medical surgical nursing practice course offered by Brainmeasures. It specifically targets nursing leaders, staff nurses, hospitalists, physical therapists, social workers, pharmacists, clinical assistants, nursing managers and other professionals who are more concerned about mastering medical surgical nursing and pass the certification exam. Your decision to earn a medical surgical nursing certification can also do a lot of good when planning to increase the level of your income. You can use your certificate to grab the position of a medical surgical nursing assistant and earn approximately $49,000 to $89,000 each year. Working as a certified medical surgical nurse is also a great possibility and this will entitle you to enjoy around $62,000 to $127,000 yearly.